That's Eliza Doolittle of course and we think it's Nicole Kidman. She had rather a waxy look about her, a slight touch of the Madame Tussuad's. Flemington's Derby Day is the smarter race meet of the Melbourne Cup racing season. It's a bit more refined. After today it all goes downhill and Melbourne Cup next Tuesday is best avoided. The Shuttle has covered more than out fair share and even provided the "celebrity" visitors on two occasions. Now we find the races rather tiring, It's better to find a local Sydney party for the day and hang out there. That saves the trouble of booking flights and hotels in Melbourne which are choc-a-bloc. On Tuesday Flemington is packed with humanity-hundreds of thousands of them,. Fascinators are so thick on the ground one could take your eye if you turned your head quickly. On Derby Day virtually every Sydney celebrity, news reader, weather girl and so on is in Melbourne as Sydney's gossip set flies down to file reports on the same Sydneysiders they saw last week. There is usually an obligatory mention of Eileen Bond. Italian designer Robert Cavalli was at the Derby, cleverly shouting the word Lavazzi (who paid him to turn up) into any microphone that would listen. As well as telling us about his glamorous new range soon to be had at Target. Getting to the Cup on Tuesday is a bit of a nightmare unless you happen to be staying with Captain Peter Jansen (right) in his magnificent 4 story city building, where once past the front door you find yourself in an eccentric English country style manor house complete with stuffed bears and hunting trophies. Jansen is a Racing Season regular and once raced Jaguar cars in England. One year with Jansen behind the wheel of an XJ Sports and English milliner to the Royals, Freddy Fox beside him, the Shuttle crouched in fear in the rear seat as Jansen floored the Jag and got us to Flemington in under 15 minutes, waving aside policeman who jumped out of his way. Leaving the Jag purring right at the main entrance of the racecourse the three of us belted through the course to the Myer enclave so Freddie and Peter could judge the first rounds of Fashions In The Fields. 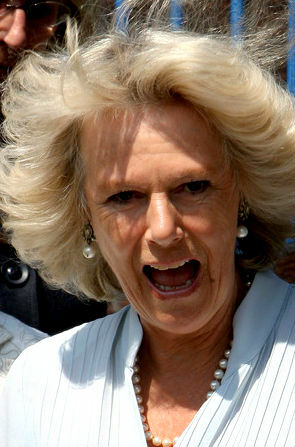 The highlight on Tuesday is of course, Camilla Duchess of Cornwall who will present the Melbourne Cup..